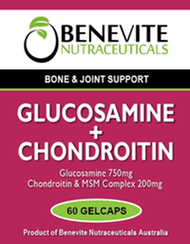 Benevite Nutraceuticals™ Glucosamine & Chondroitin Sulfate Formula nutritionally supports healthy joint function. Glucosamine and chondroitin sulfate are aminomonosaccharides produced in the body by the combination of glucose with glutamine, through the enzymatic action of glucose synthetase. It is found in many tissues and secretions in the body and is the primary substrate for the biosynthesis of proteoglycans such as chondroitin sulfate and hyaluronic acid. Glucosamine may help relieve cartilage damage, osteoarthritis, arthritis, joint inflammation, TMJ, connective tissue injury, and the overall health of tendons, ligaments, synovial fluid, skin, bones, and nails. Glucosamine sulfate (pure pharmaceutical grade) and chondroitin sulfate (pure pharmaceutical grade). 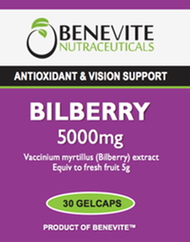 As a dietary supplement for healthy joints, take three tablets daily, preferably with meals.